The walking walker was developed to provide the user with some support at all times whilst using the product. Traditional walkers rely on the user lifting the walker up and moving it forward or on other models rolling it forward on its front wheels. 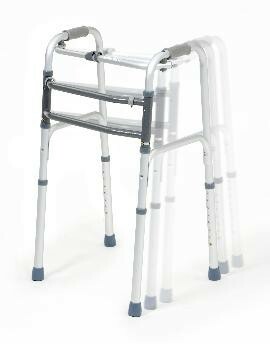 When used correctly this walker will step or walk with the user providing a unique level of assistance. This walking aid is suitable for indoor and outdoor use. It is made from lightweight aluminium tubing and folds easily for easy transportation and storage. It features height adjustable legs with rubber tips for comfort and security. The walking frame comes with two comfortable handles to grip when using the walking frame. It also features removable 'E' clips that allow the frame to be rigid or flexable to aid walking. Maximum User Weight: 28 Stone (180kg).